Finally Fashion Week (or should I say Week-end?!) arrived in Milano, so it was about time for me to get away from the computer (D&G iPhone Live-Stream or Not! ), and go "experience" fashion first hand. So I checked on CameraModa.it for the official Milano Moda Donna Calendar, called my friend up and headed straight to the Moschino show on Via Senato, this past Saturday. I do have to admit that while it was the "Official Calendar" (...at CameraModa.it), it wasn't precisely correct about the days and/or time of many shows. Hmm. And as a separate note, I also found out that from this season, all shows taking place at Milano Fashion Center in Via Gattamelata (the main venue) were Live-Streamed directly from live.cameramoda.it. Back to Moschino, my friend and I hanged-out there for a bit. There were not as many people as I hoped... and the highlight of being there were a pair of very-painful-looking hot-pink booties, and a group of "Wintours" wearing blond wigs and t-shirts that read: "I will only stay 3 days". It was fun for a second... And by the way, I would starve if I ever tried a carrier as a Paparazzi (...or Street-Style Blogger). ...I wish Moschino was free too! And what is Fashion Week without a little shopping right? !...I just fell in love with this SR belt. I was trying it on while the song That's Amore began to play on the radio. It was certainly amore at first sight! Back to our fashion procession, the next show on the schedule was Gucci. This show instead was full of people, cameras, Fashion TV... the whole thing! Not surprisingly, the Wintour Girls were also there (More on it on CocoPerez). Honestly, my main motivation for hanging-out around those shows was to see if I could spot a blogger or two, well, doing their job. And so we did!. My friend was obsessing about the shoes of a woman who was standing next to me- Peep-toe Laced-up booties. So (after carefully analyzing the shoes) as I started looking upwards to see her face and then towards the man who was talking to her, I realized that the couple was... surprise surprise.....Garance Dore and Scott Schuman (TheSartorialist)- Who are together by the way! No, I don't have a picture of them! My friend and I were giggling about the possibility of me approaching them and saying: " Excuse me, I love what you're wearing, can I take your picture?" (with my point and shoot camera)... haha, No chance in hell!. But I would just like to add that Schuman is a little bit smaller than I thought- like about my size (and I'm quite short! ), but was dressed just as I would imagine: In a Firenze meets New York kind of way. I did catch, however, Hilary Alexander from the Telegraph. Caught in the middle of traffic (and trams) on her mobile. The best part was that whilst standing outside the shows, we were given all these magazines! Plus a tote from Grazia... with even more magazines, Milano City-Guides and notebooks. It was very heavy to drag all those things around the city though! 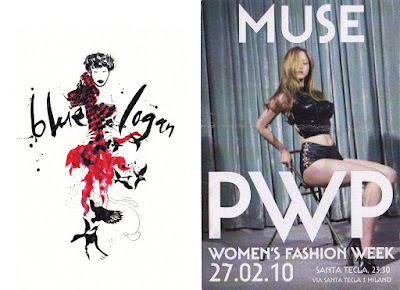 Finally.... to mix it up a bit and do the artsy-fartsy thing, we decided to continue on to the night by attending a Vernissage in Via Tortona- of Fashion Illustrations by artist Blue Logan (Followed by an after-party at Punks Wear Prada- the coolest parties in Milano! ).